Want to live to see great grandchildren? Eat your vegetables - and don't push the weather. One of the meteorologists I work with was just traumatized by lightning up in the Boundary Waters. "There was nowhere to go" she said. Trying to stay safe while camping in a thunderstorm is challenging. High winds can topple trees onto tents, and shy of retreating to your vehicle, there often isn't a good place to ride out severe lightning. A central restroom facility offers some degree of protection. Remember to wait at least 30 minutes after the last thunderclap before resuming outdoor activities on a lake or beach. You may not get a cell signal to check your favorite radar app in the North Woods, but always have an escape route, a viable Plan B. Yesterday's storms are long gone; a northwest breeze pumps comfortable, Canadian air into Minnesota today as dew points dip into the 50s under blue sky. More T-storms return over the weekend; a few may be severe. It's still unclear whether Tropical Storm Chantal will impact the Southeast early next week; updates on the blog below. A warmer atmosphere means more water vapor to fuel storms. Toronto picked up 2 month's worth of rain late Monday. Seasonably Warm - Seriously Hot Next Week? After a spell of 80s into the weekend there are signs we may really heat up next week; 90s likely by the middle of next week, a 1 in 3 shot at 100F heat next Thursday, based on ECMWF guidance. July Heatwave Central USA. It's early, but guidance is strongly hinting at a period of 95 to 105F heat by the middle of next week over the nation's midsection. 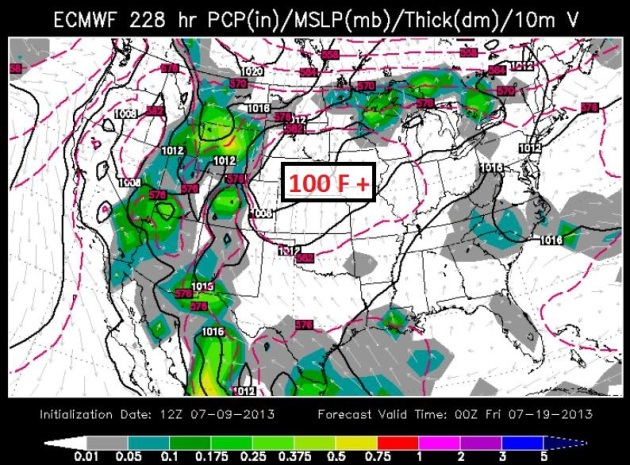 Highs may approach 100 from Omaha and Kansas City to the Twin Cities and Chicago. ECMWF guidance above is valid next Thursday evening, courtesy of WSI. Dramatic Photos Show Parts Of Toronto Underwater. 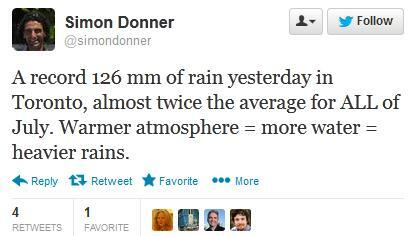 The Toronto metro area saw record rains Monday evening, as much as 5" of rain, most of that falling in 2-3 hours. Some suburbs picked up two month's worth of rain in a summer evening, turning roads into rivers, flooding out the subway system, creating nightmare commutes. 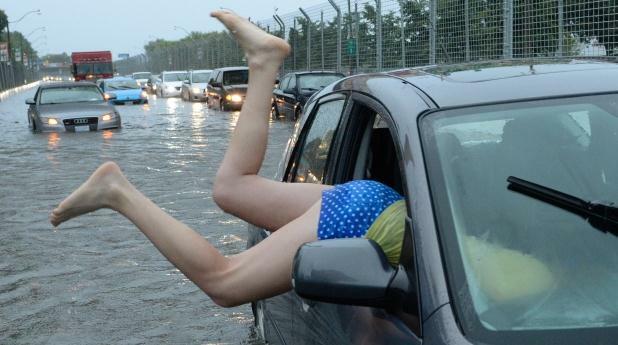 Photo above courtesy of CTV News, which has more photos and tweets from the record flash flood: "A woman gets gets back in her car in flood water on Lakeshore West during a storm in Toronto on Monday, July 8, 2013." (Frank Gunn / THE CANADIAN PRESS). 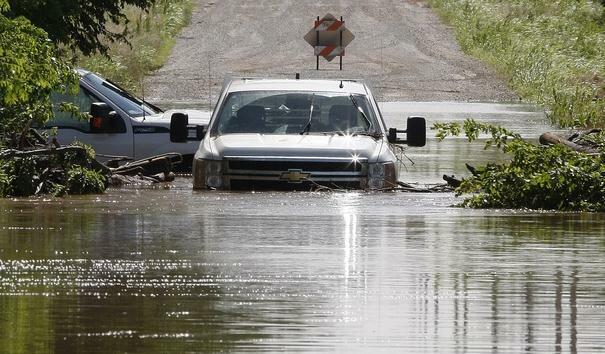 Toronto Flood Event: Continuing A Trend Of More Extreme Rains. It's the atmospheric version of The Lotto: which community is going to be next to see a 1 in 500 or 1 in 1,000 year flood event? Monday evening it was Toronto's turn. Here's a recap in today's edition of Climate Matters: "A freak flood event in Toronto, Canada's largest city, shut down the subways, stranded commuters and cut off power to 300,000 customers. Chief Meteorologist Paul Douglas has more on Toronto's record rainfall as well as extreme recent rains in the Eastern U.S. Plus a quick update on Tropical Storm Chantal which could bring more moisture to the Southeast U.S."
Most in one minute: 38 mm (1.5 in); Barot, Guadeloupe, 26 November 1970. Most in one hour: 305 mm (12.0 in) in 42 minutes. Holt, Missouri, United States, 22 June 1947. Most in 12 hours: 1,144 mm (45.0 in); Foc-Foc, Réunion, 8 January 1966, during tropical cyclone Denise. Most in 24 hours: 1,825 mm (71.9 in); Foc-Foc, Réunion, 7–8 January 1966, during tropical cyclone Denise. Most in 48 hours: 2,467 mm (97.1 in); Aurère, Réunion, 8–10 January 1958. Most in 72 hours: 3,929 mm (154.7 in); Commerson, Réunion, 24–26 February 2007. Most in 96 hours: 4,869 mm (191.7 in); Commerson, Réunion, 24–27 February 2007. Most in one year: 26,470 mm (1,042 in); Cherrapunji, India, 1860–1861. Highest average annual total: 11,872 mm (467.4 in); Mawsynram, India. Don't Get Too Comfortable: Extremes Like Last Year's Heat Wave Are Expected To Recur. 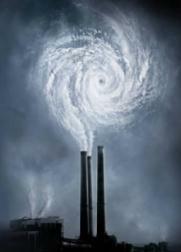 Here's an excerpt of an informative article from omaha.com: "...While extreme variability is a normal part of weather, emerging research is knitting together an explanation of why these extremes are becoming worse. One of the things that ties recent years together is a jet stream that loops more steeply than it typically has, resulting in stalled weather patterns that allow conditions to intensify. The jet stream matters because it separates cold Arctic air from warm tropical air, and it serves as the highway that most storms ride along. As the jet stream drops south, cold air flows into the U.S. As it shifts north, warm air fills in behind it. After the jet stream bypasses a region, less rain or snow falls. Robert Oglesby, a climate scientist and professor at the University of Nebraska-Lincoln, points to the jet stream to explain the past few years. “Our weather appears to be exactly the opposite of last year, but the two years have a lot in common,” Oglesby said. 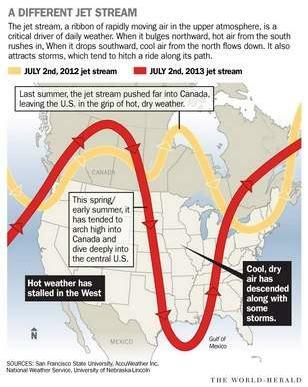 The common denominator: The jet stream has been traveling an exaggerated wavy path. In scientific terms, it's called amplified circulation..."
Hurricane Forecasting Remains A Challenge. Especially predicting storm intensity. Track outlooks continue to slowly improve, but our worst fear, as meteorologists, is going to bed with a Category 1 hurricane, only to wake up the next morning to a Category 4. Here's an excerpt of a story at The Sun Herald in Mobile, Alabama: "We're due for a big one, some say. 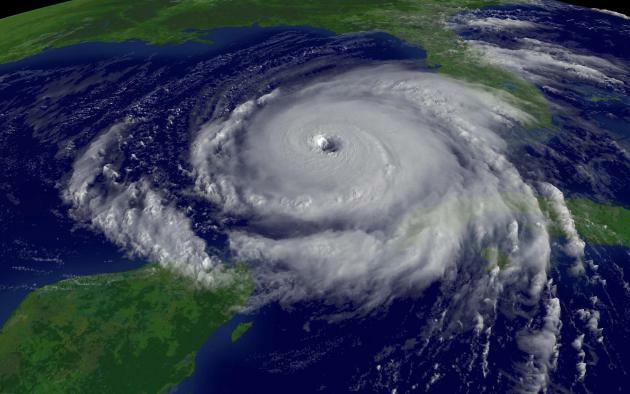 Every year now since 2004 and 2005 -- the years of Hurricanes Ivan, Dennis and Katrina -- the Gulf Coast has been "due" for a storm season worse than the year before. Now, one month into the official hurricane season, forecasters expect a double-digit number of storms to develop. 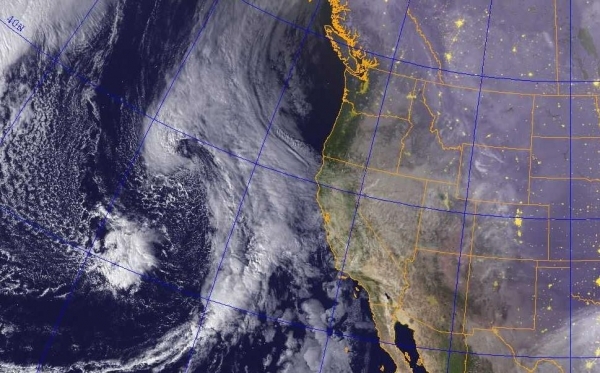 As many as 13 to 20 named systems -- storms with 39 mph winds or higher -- are estimated for the coast by the National Oceanic Atmospheric Administration this year. Three to six of those may be major hurricanes, categories three or higher. If those numbers sound familiar, that's because weather experts have been predicting more active weather patterns since the mid-1990s, says Bill Williams, director of the Coastal Research Center at the University of South Alabama..."
* The storm continues to strengthen slowly; maximum sustained winds are now 65 mph with higher gusts. 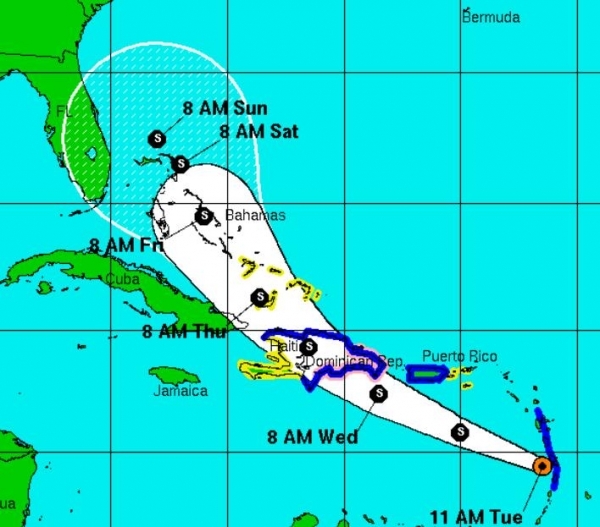 * Chantal is forecast to track just south of the U.S. Virgin Islands and Puerto Rico, hitting Haiti and The Dominican Republic as a strong tropical storm within 36 hours. * Some computer models strengthen Chantal to a Category 1 hurricane over the Bahamas by late week. * It's early, but the most likely track is into the Carolina coast by Sunday or Monday. Chantal Fix. Chantal is packing 60-65 mph winds; it's not inconceivable that Chantal may strengthen to hurricane status before sweeping into Hispaniola (Haiti, Dominican Republic) Wednesday PM hours, where rainfall amounts may be extreme. Some 5-15" rainfall totals may result in serious flooding for Port au Prince and the higher terrain of The Dominican Republic. The GFDL model solution (above) shows 86 mph sustained winds by Sunday morning just north of the Bahamas. Graphic courtesy of Ham Weather. Projected Track. The models are all in fairly good alignment until Chantal crosses Hispaniola and pushes into The Bahamas. 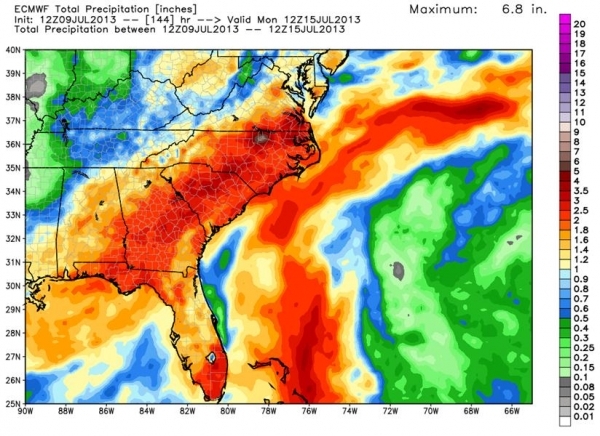 Florida may experience heavy rains from Chantal, even if it takes an eventual turn toward the Carolina Coast. Facilities from Miami to Palm Beach and Jacksonville should be on alert for late week and the weekend. Intensity Prediction. 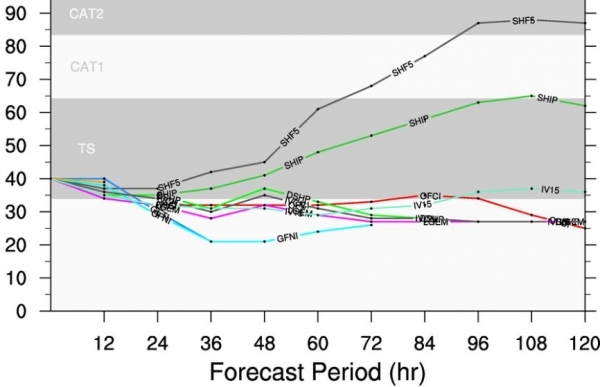 Most models keep Chantal as a tropical storm looking out 96 hours, through roughly Saturday morning. But some intensification is now expected over the weekend as the center of Chantal passes over the warm, open waters of the Bahamas. As it pushes north of Haiti it may strengthen into a Category 1 hurricane, in fact a few of the models (above) are hinting at Category 2 strength by Sunday PM hours. 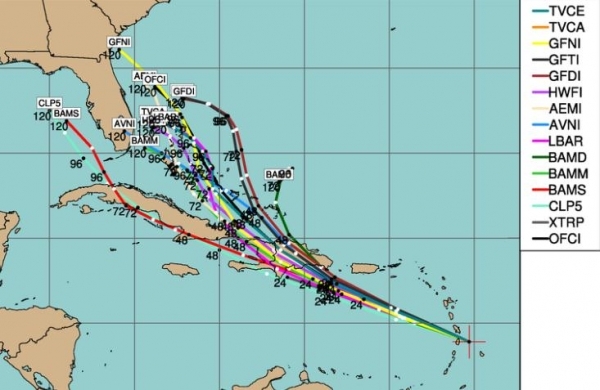 Again, confidence levels are low, but facilities from the Bahamas to the Atlantic coastline of Florida, Georgia and the Carolinas should remain vigilant and be prepared to initiate Hurricane Action Plans within 48-72 hours. Timing Chantal. The greatest threat of storm surge waves (5-8 feet above normal) and excessive inland rains over Haiti and The Dominican Republic should comes Wednesday night. Chantal is forecast to reach the Bahamas late Friday into Saturday; a few of the models showing the storm stalling out near Freeport this weekend. Image: NHC. Predicted Rainfall By Monday. ECMWF (European) data shows the heaviest rain bands from Chantal's soggy remains from near Augusta to Charlotte and Raleigh, where some 2-5" amounts are possible. Again, it's premature to project precisely where the heaviest rain bands will set up from Chantal, but odds (slightly) favor eventual landfall over the Carolinas by Sunday or Monday. Image: Weather Bell. GFDL Track. 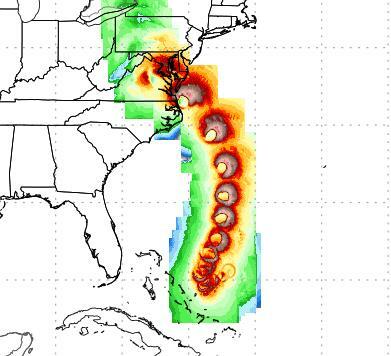 NOAA's high-resolution GFDL model shows a possible landfall from Chantal near Wilmington, North Carolina by Sunday night or Monday of next week. Confidence levels are low: Chantal's moisture may impact a wide swath of real estate from coastal Florida to the Bahamas and Carolinas. This track will almost certainly change as new data arrives - it's important to stay vigilant and prepare staff and facilities for any eventuality. 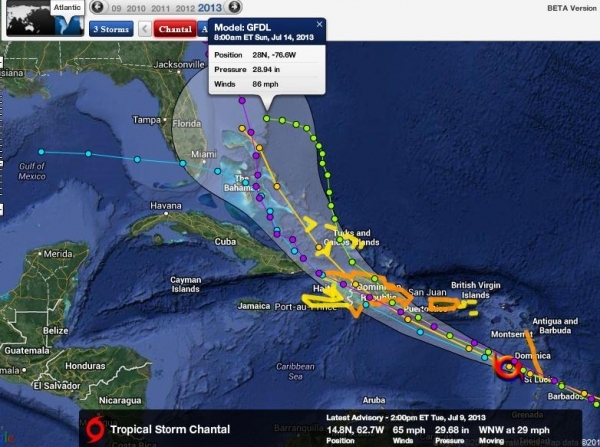 Summary: Chantal is becoming better organized, presently a strong tropical storm packing 60-65 mph. winds, heading for Haiti and The Dominican Republic by late tomorrow. Some weakening is likely as the storm interacts with mountainous terrain of Hispaniola, but many of the models now show strengthening by late week, possibly to hurricane status as Chantal reaches The Bahamas by Friday and early Saturday. From there the track and intensity prediction is very tenuous, but there's still a better than 50-50 chance that Chantal will impact the Southeast USA coastline by Sunday or Monday, either as a tropical storm or hurricane. Every tropical system is different, unique - and Chantal is not giving any obvious cues about track or intensity once it reaches the Bahamas within 72-96 hours. We'll keep an eye on the storm and keep you posted. Pollution In Northern China Has Shaved Residents' Life Expectancy By An Average Of 5.5 Years. If you've been to Beijing or Shanghai lately you won't find this story hard to believe. This is what happens when you don't have the equivalent of an EPA, when "market forces" trump all. Quartz has the story; here's an excerpt: "In 1999, Shanghai’s mayor at the time visited Beijing and, noticing the smog, said, “If I worked in your Beijing, I would shorten my life at least five years.” His comment turned out to be not just prescient but weirdly precise. According to a new study, air pollution in northern China has shortened life expectancy by an average of 5.5 years. 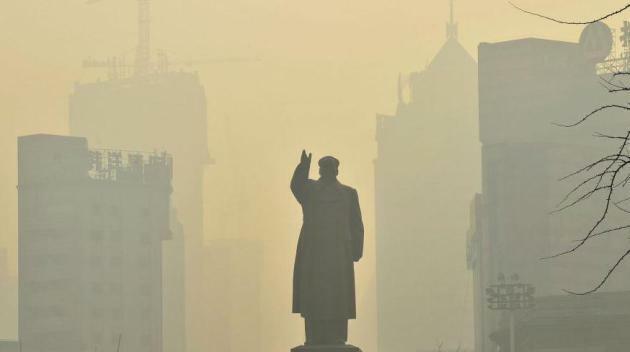 The study (pdf) by researchers at Massachusetts Institute of Technology and Tsinghua University, finds that smog in China shaved off a total of 2.5 billion years of life expectancy of about 500 million people in the 1990s. The study is one of the few attempts to measure the long-term health effects of China’s pollution, as well as one of most comprehensive data sets compiled on mortality and air pollution in China. Another study this year found that pollution may have caused 1.2 million premature Chinese deaths in 2010..."
Why So Many Flood Maps Are Still Out Of Date. Here's an excerpt of an interesting read from Propublica: "The Federal Emergency Management Agency’s flood insurance maps are critically important for millions of Americans who live in flood-prone areas. The maps determine the annual premiums for flood insurance, which is required by law for homeowners with federally backed mortgages who live in high-risk areas. 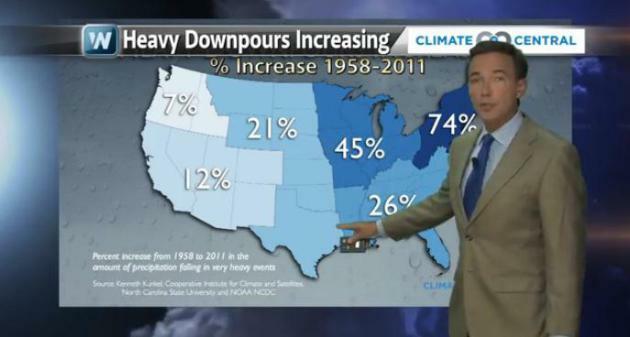 But many of the nation’s flood maps are woefully out of date. ProPublica talked with David R. Maidment, a professor at the University of Texas at Austin who has advised FEMA on flood mapping, about why the data behind modern maps is 10 times as accurate as the older data and why half of Texas still doesn’t have up-to-date maps..."
Smartphones Used To Predict Earthquakes. Here's the intro to a story at The Telegraph: "The prototype app uses the accelerometer present in the devices to act as a basic seismometer, which is used to detect the vibrations from earthquakes. Developed by a team from the Californian Institute of Technology (Caltech), CrowdShake bypasses the need for external plug-ins. Many residents of the Pasadena community, a small city within Los Angeles, currently use small seismometers plugged into their PCs or routers to detect tremors. One challenge the team faces in the use of smartphones as detection agents is differentiating between earthquake vibrations and normal movement..." (Photo: AP). Your Flip Flops Are Grossing Me Out. There's a place for flip flops, no doubt, but have you noticed more people relying on these vaguely unsightly, unsanitary forms of footwear? One writer for Huffington Post has had enough: "Some slow week in summer, I should write a tirade against flip-flops,” I unwisely remarked to my editor one disgusting August afternoon a few years back, as we walked back from lunch behind a woman whose street-blackened soles could be glimpsed anew with each schlapp!-ing step. Now, during an early-July lull between big summer movie releases, he’s gone and called my bluff. And the truth is, I’m not really one for composing tirades. I’m a live-and-let-live sort when it comes to personal grooming and style, and whatever qualities I’m remembered for at my funeral, I’m fairly certain neither hygiene nor chic will top the list. 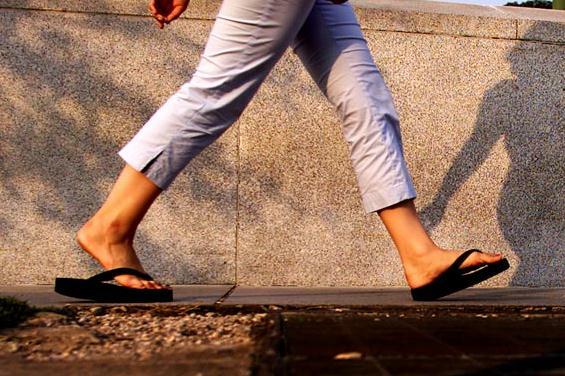 But the increasing prevalence of all-day urban flip-flop wear during the summer months is something we need to talk about as a culture..."
Photo credit above: "The bane of society." Photo by William Philpott/Reuters. 87 F. high in the Twin Cities Tuesday. 84 F. average high on July 9. 87 F. high on July 9, 2012. .34" rain in the Twin Cities Tuesday. 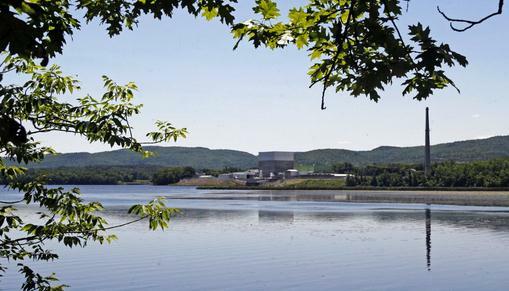 Climate Change To Strain Water Supply Used By Power Plants: Study. Between cooling power plants and enabling fracking operations, a lot of fresh water is going to be diverted in the months and years ahead. Mark my words: water, not oil or gas, will quickly become the most precious natural resource of the 21st century, worldwide. Here's a clip from a story at The Sydney Morning Herald: "Waterways warmed by climate change will increase electricity prices by as much as a third in southern Europe as producers struggle to cool power stations, a study showed. Countries from Romania to Bulgaria and Slovenia face the biggest price increases, according to research today from the Laxenburg, Austria-based Institute for International Applied Systems Analysis. Dutch, German and Spanish scientists participated in the study. “The combination of increased water temperatures and reduced summer river flow under climate change is likely to affect both hydropower and thermoelectric power generating capacity in Europe,” wrote the authors, led by Michelle van Vliet, whose research focuses on how warming climate will affect world river flows..."
Hurricanes Likely To Get Stronger And More Frequent: Study. Meteorologist Andrew Freedman has the story at Climate Central; here's an excerpt: "...With the population of coastal areas growing daily and sea level on the rise, how these monster storms may change as the climate continues to warm is an increasingly urgent question facing climate scientists, insurance companies, and public officials. A new study by Kerry Emanuel, a prominent hurricane researcher at MIT, found that contrary to previous findings, tropical cyclones are likely to become both stronger and more frequent in the years to come, especially in the western North Pacific, where storms can devastate the heavily populated coastlines of Asian nations. Emanuel's research showed the same holds true for the North Atlantic, where about 12 percent of the world's tropical cyclones spin each year. Emanuel's study casts doubt on what had been the consensus view of most climate scientists — that in most ocean basins, tropical cyclones are likely to become less frequent as the world warms, but that the storms that do occur are likely to contain stronger winds and heavier rains..."
Arctic Sea Ice Melt Speeds Up. Here's the intro to a story from Minnesota climate scientist Greg Laden at scienceblogs.com: "Earlier in the northern summer, it looked like the rapid melt of Arctic Sea ice we’ve been seeing over the last several years was happening again, but rather than being a record year, it was merely tracking along the lower side of the distribution of the long term average. Last year, in contrast, the amount of sea ice hit an all time low early in the year and then broke previous records into tiny icy pieces. One of the reasons last year’s ice melt was so dramatic is that an early storm churned up the ice and got melting going a bit early. 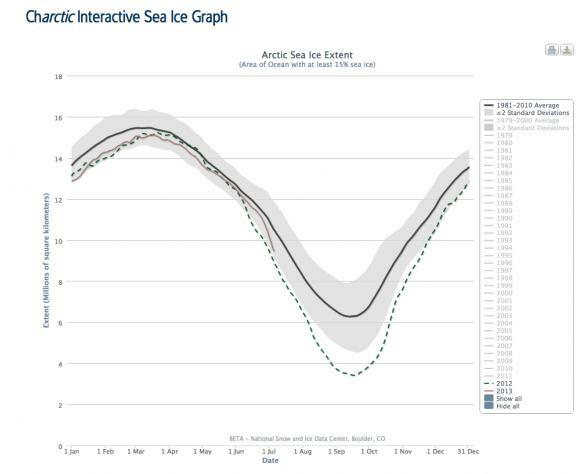 This year, there was no early churning up event, but over the last several days of June and beginning of July, the rate of sea ice melt has suddenly increased dramatically and this year’s track is looking like it may come close to catching up to the previous year’s unprecedented extreme..."
State Department Admits It Doesn't Know Keystone XL's Exact Route. Say what? 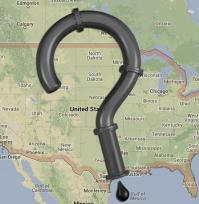 DeSmogBlog has the details; here's the intro: "The State Department's decision to hand over control to the oil industry to evaluate its own environmental performance on the proposed Keystone XL tar sands pipeline has led to a colossal oversight. Neither Secretary of State John Kerry nor President Barack Obama could tell you the exact route that the pipeline would travel through countless neighborhoods, farms, waterways and scenic areas between Alberta's tar sands and oil refineries...."
How To Talk To Your Parents About Climate Change. It's been interesting seeing the evolution in thought with my father, an uber-conservative. Lately he's been taking a closer look at the data, and peer-reviewed research, and he's pretty much reached the same conclusion that most reach when they actually dig into the science: somethat has, in fact, changed, and our release of greenhouse gases is probably impacting climate (and weather events). Here's an excerpt from Huffington Post: "Maybe it will turn out that human intelligence won't be favored by selection, and we'll soon grow ourselves into oblivion. But no matter what our eventual fate, I think it would do our souls good to at least try to slow down our self-destruction. After all, just because a penchant for murder and Kardashians seem to be inherent human flaws doesn't mean we shouldn't do our best to minimize them. I don't expect public opinion on climate change will be swayed by columnists and pundits preaching to their choirs. Those who want to ignore the vast scientific evidence on the subject have likely already skipped to the comment section below to try to convince you that since I'm not shouting these things naked from a wooden hut in the middle of a bog, I'm a hypocrite and deserve to be ignored. For those still reading, I have a suggestion. Most of us don't have millions of dollars to go toe-to-toe with the disinformation campaign being waged by the oil and gas industry. But most of us do have living parents. So let's talk to them about climate change. Because if we can't convince the people who love us more than anything in the world to take action on climate, who can we convince?..."